I know, I know, I'm late with this. I could tell you about the reasons for this delay, our mildly excessive optimism regarding the timeframe, and the bugs we had to fix instead of developing, but I think you would rather hear about how's the new stuff going. So as I wrote in the last blog, we're working on the new research system. This will use a fixed tech-tree system instead of the random lottery thing we have now. Consuming kernels won't yield direct research results, but research points, which will accumulate and can be spent to unlock items in the tech tree. Pretty standard stuff I guess. 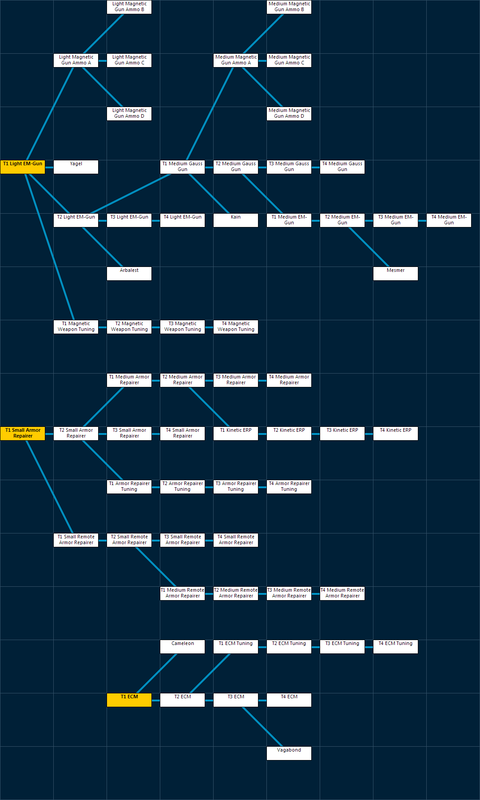 What we have done so far is working out a concept how the trees should be built up, and did an internal tool for this which works directly from the database. So once we have all the tree layouts, it's just a matter of some proper UI skinning to get them into the game. We'll have separate trees for the 3 main factions (Nuimqol, Pelistal, Thelodica), one for the modular colony system, one for the industrial items/robots, and one for the common stuff. The latter two might be even merged, this is yet to be decided. Each tree will have multiple subtrees with their own root points from where you can start out your research. In the case of the main factions, this looks like one tree for offensive items, one for defensive items, and one for EW/faction specific items, with robots intermixed. The trees are laid out on a grid: you work your way from left to right, from the standard items towards the high-tier items. The grid columns also determine the point cost of the items in that column. (Research points are discussed in detail in the previous blog.) This is the reason why the T1 ECM root is placed further to the right as you can see in the picture. We'll introduce prototype versions for every standard robot in order to give another reason to research them. This also means that you'll only be able to reverse engineer and create CTs from prototype robots. 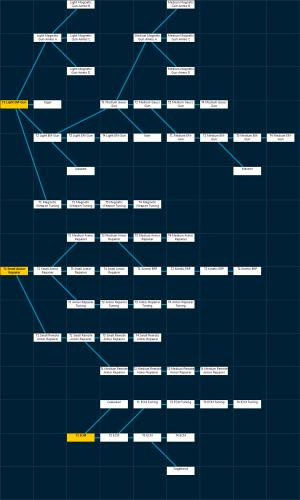 Once we have worked out all the trees, we can start integrating the system into the game client. Obviously it won't look like this in the game, the tree nodes will be square and use the proper icons and tier markings. I'd like to quickly touch this topic too. Some of us who are waiting for the others to finish their research system work had nothing better to do and started working on an extended combat log system. "Combat log" stands here not for the realtime log that you see in a window while shooting each other, but the history that we save to the database for further use and datamining. The interesting thing for most of you here would be a whole new level of trophies/losses logs (or as you better know it: killmails), which would be tapping into these logs and include anything you want starting from repaired armor points to transferred energy amount and yes, even EW usage. Not to mention that this also paves the way for an achievement system. Our plan for the first step is to set up the detailed logging and make the current format killmails work from that, and then expand from there. We also intend to send out all of the raw logs via our API, so the nice killboard-hosting guys will be able to create some battle statistics like damage dealt over time or ECM accuracy or whatever you can think of. Of course we also intend to do some fancy graphs and stats of our own in the game once we're done with the more important things. This is it for now, I promise you won't have to wait another 3 months for the next update. Basically, those logs will provide more than enough information to derive ewar/logi assists on killmails. Good news indeed. Sounds good keep working guys !!! Now they won't be able to be Epeen freaks about the numbers since they are too blind to see and count ewars. ^^ the above will show BOTH sides.. noob. Noice theengs! Keep working guys! Looking forward to the extended combat log system. Sounds interessting. Whats happining towards the steam release? New research system is sort of a little milestone. Good one! Glad to see an update, Thanks for keeping us in the loop guys. Keep up the hard work. Nice update , keep us informed. With standard robots needing a prototype robot to RE, will the prototype robot have slightly better stats then a standard robot? Twoshades: yes, the current plan is to give them slightly higher CPU and reactor capacity, and possibly higher base mass (so modules would affect their speed less).